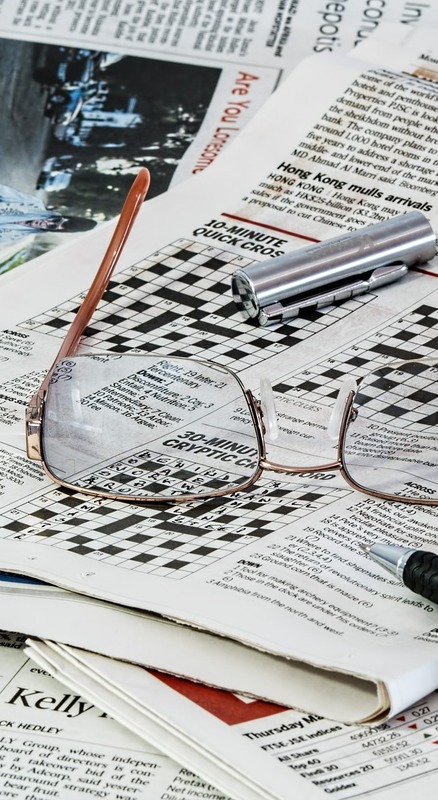 MASTER PROBLEMS Work and Leisure How filing crosswords can help you relax? How filing crosswords can help you relax? Milions of persons regularly do crossword puzzles. If not, perhaps you have been missing something, for crosswords can help you learn while you relax. When you endeavor to solve crossword puzzles, you will no doubt find that your vocabulary, as well as your appreciation for the shades of meaning of words, increases. As a result, everyday reading and conversation can become more enjoyable. Also, many interesting and useful facts will come to light when, on occasion, you have to do research to find the correct answers. So working on a crossword, even for a short time, can provide a refreshing change of activity. Crosswords are not altogether new. About 100 years ago one was discovered, scratched into a fragment of wall plaster, during the excavations of the 2,000-year-old Roman city of Corinium, in Gloucestershire, England. But their development in England as word puzzles dates to about the middle of the last century. Soon they were printed in children’s books and various periodicals. However, it was not until this popular pastime migrated to America that the puzzle developed into a serious adult diversion. The first modern crossword was published on December 21, 1913, in Fun, the Sunday supplement of the New York World. Although this puzzle was presented as just one of a varied group of mental exercises, it quickly caught the public’s fancy. Since then, crosswords have spread into all countries. They have been compiled in nearly all languages. Today countless millions of people have learned to relax and learn with their favorite crossword. In order to solve a crossword puzzle, you need to know something about the kinds of clues that may be employed. They can be divided under five main group headings. First of all, there are the straightforward DIRECT clues, with no hidden meanings. These clues can sometimes be single-worded, seeking a synonym (a word with a similar meaning). If, however, the single-word clue itself has more than one meaning, finding the correct answer will not be so easy. The correct word, of course, is determined by the interlocking letters of the crossword itself. A PALINDROME, sometimes called a ‘sotadic’ after a Thracian, Sotades, of the third century B.C.E., is a word or phrase that can be read the same backward as forward. Some examples are: Mum (or Mom), Dad, Eve, Hannah, deified, rotator, kayak and level. Turning of a word back to front, not to form the same word (as in the case of a palindrome), but a completely different word, is known as a REVERSAL. Zeus [Suez]; Enid [Dine]; War [Raw]; Reviled [Deliver]; Flog [Golf]; Repel [Leper]; Snug [Guns]; Stressed [Desserts]; Smart [Trams]; Yard [Dray]; Stop [Pots]. By rearranging the letters of a word or phrase to form another word or phrase, we have what is termed an ANAGRAM. There are thousands of words that in themselves prove to be one-word anagrams. To illustrate: TESTAMENT - Statement; EDUCATION - Auctioned, Cautioned; TIREDNESS - Residents, Dissenter; ARGENTINE - Tangerine; ONTARIO - Oration; PERSIA - Praise, Aspire. If a crossword compiler desired to do so, he could clue this word for his readers with what is termed a CRYPTIC clue. As you will observe, this cryptic clue guides the solver toward the solution, although the answer (“schoolmaster”) does not readily present itself. There are in fact many different kinds of cryptic clues and they are not all easy to solve. Yet, in some English-speaking countries, they are often more popular than the simple, direct type of clue. Cryptic clues can be used with palindromes, anagrams, spelling puns, spoken puns, charades and reversals. Crosswords can, of course, be slanted toward a particular interest, or compiled with a specific subject in mind. When you look up those texts you may find other information that interests you even more than the word that you were seeking. Take time to enjoy it. After all, crosswords are meant to be, not only mentally stimulating, but also instructive and enjoyable.